LEDs are becoming more and more useful in filmmaking. And for good reason – they have a whole host of advantages in modern video work. In this article we’ll take a look at the advantages and use cases for this type of video lighting, as well as list what we consider the best LED lights for filmmaking are. Let’s first take a look at the 3 major advantages that LED lights offer for use in filmmaking. Advantage number one is the relatively small consumption of electricity. Of course, for film work, one considers that they’ll use a fairly large amount of electricity is filming the average project. Even in professional video studios, where there is a continuous process of shooting and lighting scenes, electricity bills are not the largest expense item. But if you’re still worried about low power consumption, then LED lights are scientifically proven to use less electricity. And if, as in a lot of cases, a generator is most likely to be used as an autonomous power source for a halogen as a stand-alone power source, a luminescent illuminator can already operate from a portable battery with an inverter weighing 5-6 kg. The LED source consumes even less than the luminescent source, but most importantly, it operates on a DC low voltage current and therefore can operate from portable batteries used for camcorders. As anyone who’s been involved in large video projects know, this is often the decisive factor in choosing what kind of lighting to choose. The second advantage is increased safety. Of course, LED illuminators are crackable, as well as potentially broken during falls, but are overall more durable than other types of traditional lighting. This is because of the way they’re built. In all other illuminators, glass lamps are used, and glass is a very fragile material. Halogens and flashbulbs cannot even be touched with fingers since the dirt remaining from them will lead to a potential breakdown when heated. The LED illuminator is a practically non-heating design that can be easily and safely cleaned if it gets dusty – in that event, just shake it and wipe it with a cloth. Also, considering safety, the smaller amount of electricity consumption leads LED lights to be cooler and therefore safer for touching and moving, etc. The third major advantage is power adjustment. Yes, LEDs can shine with different power! That’s true with flash-lamps and halogens, too. But we’ve found that the more modern LED lighting is easier to adjust and manipulate on-set. When adjusting something like a halogen device, reducing the power supplied to the lamp can create problems. Since the glow in the halogen is a process of incandescence, then, by reducing the power, we reduce the color temperature. As a result, there can be a distortion of colors. Obviously, this isn’t ideal in video work, so that’s another advantage for LED lights. Let’s take a look at what we consider the best LED lights for whatever video project you have in mind. The first on our list is the LG 500 B / LED V-mount – LED constant light panel with adjustable color temperature (bi-color, 3200K-5600K) and built-in V-mount connector. A distinctive feature of this illuminator is low power consumption, high light output, large radiation area (30 x 15 cm), as well as smooth adjustment of color temperature and brightness. The panel provides uniform illumination of the object. Illumination at a distance of 1m is 3150 lux, 2m – 850 lux, 3m – 460 lux. or work using the supplied power adapter. The cooling of the illuminator is convective. The body is made of anodized aluminum, painted with black powder paint. Metal reflector shutters limit the light flux and help to correct the dispersion angle. The brightness of the luminous flux is smoothly regulated by two dimmers (independently the group of LEDs of ‘cold light’ and the group of LEDs of ‘warm light’ are regulated). Next up we have the Universal bi-color LED panel DEDOLIGHT Tecpro Felloni 50 Bicolor High Output (TP-LONI-BI50HO), complete with 576 bright diodes. This light has increased luminous efficiency, compared to standard devices of the TP-LONI line. It comes with a power adapter from the mains, and also has connectors for V-Mount and NP-F batteries. The color temperature of the DEDOLIGHT Tecpro Felloni TP-LONI-BI50HO is smoothly adjustable from halogen to daylight studio light. The panel is dimmed with a dimmer that can be attached to the back of the panel or removed and through the cable to control the brightness of the light stream remotely. The package includes panel Tecpro Felloni Bicolor 50 High Output, a lyre with fastening, network cable, and adapter AC-DC, removable dimmer with cable, diffusing filter, magnetic holders for film filters. The color temperature is smoothly adjustable in the range from 2800K to 10000K, the hues and colors are smoothly adjusted throughout the spectrum of RGBW colors and the green correction is performed. The L10 is the brightest and largest L-Series light to date. Its imposing lens size of 10 inches (25.4 cm) and powerful light output allow the device to be installed at great distances, clipping objects with a natural and pleasant light flux. With a power 2 times higher than that of the L7, the L10 is one of the brightest LEDs with the Fresnel lens on the market. Adjustability is a key element of ARRI LED lamps, and like its smaller counterparts L7 and L5, the L10 also has a color adjustment. The user is provided with full control over the color of the light flux: the ability to adjust the color temperature from 2800K to 10000K, and also perform a correction of the green-magenta hue. 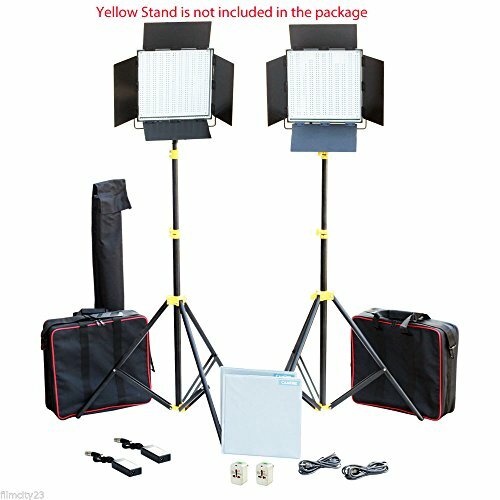 Complete with almost an operatic quality to the light and all the necessary accessories, such as a dimmer, 1 album case with gel color filters, adapter 15V with DC cable of 1.7 and a tripod. This lighting equipment meets the requirements of all operators: from beginners to professional users. A small mass and a square shape make this camera light very convenient for use in tightly confined spaces where it’s not possible to place a light of a larger size. The device perfectly illuminates even the most darkened rooms, but at the same time it doesn’t cast awful shadows like some lights often do. In fact, it’s very soft and creates a pleasant atmosphere. The Camtree lights are equipped with a dimmer, which helps to control the brightness of the light. This makes it available for use with compact DSLR cameras. Thanks to the new LED technology, the lamps do not heat up, do not flicker, and their average service life is very impressive. LED design keeps light cool even after prolonged use. If you try to reduce the power supplied to the fluorescent lamp, the lamp will begin to flash. The starter, which lights up the gas in the tube, slowly accumulates energy, and the lamp will flash noticeably for the eye. Therefore, adjustment on luminescent illuminators is possible only in one way – turning off the lamp itself. It’s an on or off issue. If, for example, the Lumifor MIRA LFL-632 SR KIT has 6 lamps and has 6 switches on the back, the adjustment step for such a device is 1 lamp. It is not known whether someone tested in practice, but the service life of LEDs is 50,000 hours. This figure, of course, is more of a marketing move, since this is the lifetime of the diodes themselves, and the illuminator is likely to fail more quickly, since this is a separate component. But it’s still a very long time, especially in comparison with the life of a halogen lamp. In principle, of course, they also heat up, but to acceptable temperatures. For example, getting a burn is nearly impossible. And most importantly, the LEDs will not melt the filters. So if a lot of your work involves using various colored filters, you’ll get a huge pleasure from working with LED lights. This is a large panel, measuring 15×23 cm (plus fields of 1-2 cm). Try putting a tube on such a panel to get a spotlight – it’s difficult. Nevertheless, several manufacturers have already started producing devices with bright LEDs, concentrated in one small rectangle, for example, lights like the Jinbei EF-100 LED. Another weak side of the device is the spectrum of its radiation, with a pronounced blue color. Since the radiation of an LED is not a heating process, the radiation from it is slightly different from the spectrum of sunlight or flash. But this becomes critical only for very professional work, and it can of course be corrected fairly simply by using light filters. Yes, the manufacturers of LED devices are successfully fighting this phenomenon. Approximately the same evolutionary steps at one time occurred in the luminescent lamp industry. First, there was a general interest, then users found critical flaws (flickering, harmfulness to the environment, an unpleasant spectrum) and began to struggle with them. Modern luminescent studio illuminators do not flicker anymore, they shine with the desired color temperature and take a more agreeable approach to the environment. They can be seen now in any video studio. Budget is of prime importance. However, with something like lighting, you don’t need to break the bank to be able to put together a very competent and powerful video lighting setup. Looking at the use case for why you need the lights, and specifically how you’re going to use them, is always of prime importance. So is portability and durability. Are you going to need to travel a lot with the lights? Do they need to be extra strong and durable? All of these are important considerations when looking at buying any kind of video equipment, especially LED lights. We hope this article on the best LED lights for filmmaking has been helpful. What is your favorite LED lighting setup for video? Let us know in the comments below. Running a Video Production Company: How is a Video Production Company Run? Thanks . Appreciate that, Raul.